The outcomes of all elections are the resultants produced by misshapen class struggles. The consciousness of the participants and the audience are formed in the policies. But the institutions as well as the consciousness of the participants distort the process too. This is especially true for the United Kingdom political system. During elections the class base and regional biases of the contenders become increasingly clear. This does not make the rules and procedures under which they are fought “neutral,” fair and balanced. Indeed, participation reveals the biases even more clearly. Unfortunately, the political parties that usually take part have a vested interest in failing to make this clear to a wider public. Over UK history, the institutions that supposedly reflect or refract democratic aspirations have evolved to favour of the aspirations of the dominant classes and groups albeit this has grown less visible and seemingly more neutral. The UK has three seats of government –the monarchy, the House of Lords and the House of Commons. Only the Commons could remotely be described as “democratic.” Yet even here, it is still necessary for any newly elected Member of Parliament to swear an oath of fidelity to the monarch his or her heirs and successors that makes hypocrites out of any genuine opponent of class privilege or honest republicans. This has been a recurring point of contention by Irish republicans for over a century. Once elected into the pool from which members of the government are selected, it is necessary to become a member of the monarch’s Privy Council by swearing yet another oath of fidelity as well as undergoing yet another feudal ceremony. The government of what became the United Kingdom after 1707 had its essential institutions (monarch, Lords and Commons) affirmed by Charles II and have remained the same since those days. Although the balance and powers between Parliament and monarch and between Lords and Commons have moved more and more in favour of the lower house, it would be an enormous mistake to see the House of Commons as a repository of democratic values. Late feudal and early capitalist institutions, procedures and practices still hold enormous power. A Member of Parliament, nowadays, is elected for a geographical constituency. These are arbitrary boundaries. Yet in the recent past these constituencies included transparent bastions of class privilege such the pro-Tory university seats abolished since 1950. Still remaining, the Remembrancer is the City of London Corporation’s representative on the floor of the House of Commons. Only elected members and duly appointed officials are allowed this access. Yet this unique anachronism has a privilege that no ordinary member of the public can possess. The legacy of Empire continues through the British Overseas Territories, eg the European Parliamentary seat of South West England includes Gibraltar. The first-past-the-post system applies in the individual constituency with the candidate obtaining the largest number of votes winning. Because of the attractive powers of capital with its growing geographical concentration of wealth and, of course, ever growing population has produced a bias towards the South-East of England with the largest number of constituency seats. In 2017, the Tories had an increase in their share of the vote. This is unusual because they have been in decline in seven out of nine general elections since 1931. The effect of this is as John Ross wrote, “The Tories collapsed further back into their South of England and rural heartland. Despite the dramatic 15.2% collapse of Liberal Democratic votes the Tories could only pick up a tiny 0.8% in a winning year – although it is unusual for them to increase at all between election victories.”2 In Scotland in 2015, The Scottish National Party could take fifty-six of fifty-nine seats with only one going to the Conservative, Labour and Liberal-Democratic parties. The unrepresentativeness of the electoral system is blatant. The regional diversity of the UK is visible and extreme. Various partial attempts have been created to address this concern. But they have not been approached as a single UK-wide issue. Scotland has a Parliament while Wales and Northern Ireland have Assemblies; all have different powers and responsibilities. The current system may benefit Greater London, the South East and the East of England with just over a third of the total population. But in areas such as the midlands and the north there are no locally based governmental champions that can directly address their regional wants, needs and aspirations. Instead they have to hope for the attention of the House of Commons at Westminster. Talk of creating a “northern powerhouse” or of enhancing northern cities while lacking any institutional structure make this a difficult expectation. Regional assemblies need to be created that reflect the real structure of the communities that are found in the UK. Ironically the best reflection of the different polities, economies and communities that can be found are those established by the European Union for purposes of statistical measurement – Nomenclature of Territorial Units for Statistics (NUTS).3 These territorial units should be the basis for English regional representation. Regional assemblies can deal with the issues that affect local economies while Westminster should deal with issues of foreign affairs, defence, macroeconomic policy as well as putting in place the essential regulators of services such as health, education, economic affairs. This would be essentially federalism; it is a valid demand. Consequently, the number of MPs need not be as large as it is at the federal level. Though the first-past-the-post system is seen as ripe for change, the constituency-based system also needs to be abolished. Members of Regional Assemblies and National Parliament should be elected on a regional basis in direct proportion to the percentage of votes attained in each regional area. Consequently, a multi-member approach would allow a far wider range of views to be represented. Put simply, regional assemblies should comprise one single large constituency; a federal parliament the same constituency contributing its proportional share of elected MPs to Westminster. Prime Minister David Cameron’s desire to reduce the total number of Westminster constituencies to six hundred has produced many boundaries that have no real bearing in the way people live their lives. Devolved government in Scotland, Wales and Northern Ireland has created the so-called West Lothian question where the right of MPs where devolved government exists to vote on issues affecting England that English MPs cannot in the devolved countries. Yet the total number of Westminster MPs is still seen as far too great, especially when it is borne in mind that most lack the ability or base to ever become members of the government. A reasonable size for an elected parliament of the UK is probably about four hundred. Many opinions and points of view cannot find adequate expression through the current electoral system, even if they can find a base in a single constituency. The current electoral system of first-past-the-post also produces so-called “broad church” parties. These parties do not reflect a point-of-view so much as a sentiment. Their members and adherents almost never wholly agree with the policy positions put forward by the parties’ leaderships. Everything becomes a “compromise,” to hold the party together. Unrepresentative minorities, reflecting powerful interests, exist in all the so-called “broad church” parties. This way powerful class forces exert a powerful influence over weaker groups. The current situation with Remain advocate, current Prime Minister Theresa May at variance with many even in her cabinet is mirrored by EU sceptic Jeremy Corbyn surrounded by his antagonistic forces. It becomes hard to identify policies as well as the leaders’ willingness to implement them. This is a never-ending source for disillusionment in politics and politicians. Politics ceases to express hopes and aspirations but becomes an application of wishful thinking. One major side effect of real electoral reform could be to alter the kinds of political parties that currently exist. Many of the left know that the constituency based, first-past-the-post is rotten and is a very poor way of obtaining accurate electoral representation. In a general sense there is a recognition that a better form of proportional representation is necessary. Regrettably, this has often been understood as a commitment to Single Transferable Vote (STV). There are various methods of STV but the main features are that the voter has to order the parties or candidates in order of preference, usually numerically. This is so that a voter preference for one candidate can be transferred to another candidate. It is, nonetheless, very difficult for many voters to understand causing enormous confusion. This can produce a result where a candidate with the highest number of votes can be “ganged up” against and lose. It also biases outcomes towards the candidate who least offends over the candidate who takes a strong stance that can cause antagonism from vested interests especially when that candidate is raising a controversial issue only to eventually be proven correct. There is an inherent “conservative,” risk averse bias to STV. Put simply, it biases results towards “centre” type candidates, or candidates who claim to be in the centre. It is hardly surprising this is the system preferred by the old Liberal Party and the Liberal-Democratic Party and the Electoral Reform Society. These are also the principles governing the D’Hont system for the Scottish Parliament. In many ways, it was designed to keep the Scottish Parliament weak. The left has nothing to gain from STV. Rather it should be developing principles that allow the maximum number of hopes, aspirations and points-of-view to be expressed within the electoral system. It should be assisting the currently unrepresented to be heard, even if they are the views of a minority. At present, and under STV, minority views simply never get heard; they do not have the opportunity to grow from small to larger. Removing the distorting prisms that the electoral system produces should be the governing principle. Bringing to an end the use of the electoral system as a way of silencing disagreement and dissent should be its goal. Although it is often derided by established interests, a system of Pure Proportional Representation will create the largest possible number of different voices in an elected assembly. 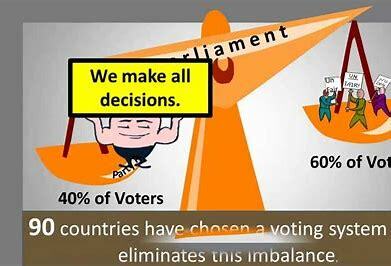 Seats should be in direct proportion to votes cast eg fifty per cent of votes means fifty per cent of seats, twenty per cent of the votes means twenty per cent of the seats etc.. It also means that no vote is a wasted vote because even if a party gets only one representative, it is possible for a minority to obtain election; a voice that would normally be elbowed out can be heard. This is an important principle for a just system of proportional representation. It is the approach carried out in Israel and the Netherlands. Because an individual is being elected to a representative chamber and from it to form a government, it is essential that the party submit a list in advance with the order that the individuals are ranked. This is the closed party list proportional representation system. From this the voters can better assess the parties’ commitments to its declared policies as well as its commitments to race and gender equality, and commitments to left and right in their own ranks. It will be from the manifesto and the order on the list that the party will be judged. The quirky individual or locally based individual will no longer carry the weight they have in the past. Of course, individuals with a large personal following may still exert an influence, but the bias is to the party because it can form the body of men and women necessary to perform the tasks and duties of government. Unless there is a large number of voters wanting one-person-dictatorial-government, the party is the best expression of this. This system avoids all complexity at the level of the voter who has only one vote and puts it against the party he or she feels best expresses his or her wishes. There is no need to rank or order votes according to a sliding scale of preferences. It makes counting simple too. During the lifetime of a parliament or government, alliances between different parties and individuals can be formed. These should be permitted with the only mechanism of censure being the ballot-box. Not only will all electors have at least one representative that can best articulate their aspirations and hopes, but a more dynamic process is being created. Voting for the least worst of all possible options will cease. (No longer will it be possible to argue a case for an unacceptable candidate just to keep the Tories out or the nationalists out.) Electors will be asked to vote for what they want not what they are likely to get. Removing the artificially drawn boundaries will make it easier for voters to focus on the national tasks in hand. It will shift elections away from entrenched interests towards ideas, hopes and aspirations. This will place a greater burden on parties to better express the hopes of the people who vote for them as well as properly organise themselves. Hopefully, this will invigorate the electoral process by permitting new exciting ideas to be discussed and issues to be more politicised. Scotland and Wales should remain one constituency, however representation across the United Kingdom will need to take cognizance of the enormous geographical differences that exist. Elections according to the total electoral population will be required for the UK. Although it is beyond the scope of this paper there is a strong case for regional champions in the shape of regional assemblies in England. This would make more sense that attempting to create northern powerhouses through major regional cities; an approach ignores small towns, rural and coastal areas. An authority that can handle all local issues is urgently required. The table uses various sources for the total regional populations within the NUTS areas, they are not precisely accurate, so they should be used as near approximations. The outlined case is applied to the current United Kingdom; it is not a denial of the case for an independent Scotland or Wales, or that the six counties of norther Ireland should remain in the UK. The total number of representatives within the suggested federal parliament is set at four hundred though this is a guess and can be set at different levels without affecting the principles outlined. The areas need not be accepted in whole or part; indeed there may be strong case to merge the North West and the North East into one region with one regional assembly. Political parties can arise for a number of reasons. They usually arise to express some interest that is not felt to be adequately represented either in parliament or government. Parties can attempt to represent class, women, ethnic minorities, geographical areas, etc.. They may exist for some short term goal such as to oppose a new infrastructure development. The reasons they come into existence are their own and not the electoral system’s. Perhaps, most importantly, it will shift politics away from established parties where electors often imagine their interests can be best, but never fully satisfactorily expressed or achieved. It will shift politics to more defined goals creating a politics based on achieving ideas and aspirations. That will produce a livelier, more engaging, exciting kind of politics. However, at present, political parties do now need to be registered, and their emblems registered with a designated officer who is responsible for their conduct. In elections where lists are required, it has become essential for parties to have them submitted by the appropriate time and date. This should become a universal demand. The ridiculously biased system of deposits should be abolished. At present, candidates getting below a small percentage of the vote can lose their entire deposit. Only parties gaining above that can keep their deposit. This encourages “conservatism” in the electoral process. Deposits can only be lodged in cash or by banker’s draft, not cheques or money transfer. The system is not only antiquated but also absurd. This would require the party to go into the communities and try and win some popular support. It would also invigorate the political process too. There will be occasions when an elected representative resigns, or passes away. A by-election has the advantage of allowing the government and the opposition an opportunity to assess their popularity. This may change the balance of the government. Although this is still possible with this system, a simpler approach can be achieved by simply appointing the next person on the list to take up the vacant position. The principle that no vote should be a wasted vote by making it easier for all points of view to be represented will enrich all political life. This approach can end the current disillusionment with politics that leaves enormous numbers weakened. As an agitational demand this type of proportional representation can invigorate large numbers. Nevertheless, powerful groups and people will oppose any reduction of their privileges. But in advocating this type of change a model for future progress becomes possible. At present, working class people are represented on the basis that they are best represented by the best type of “compromise” that can be achieved from powerful interests, but not on the best type of society that can be built in their interests. Shifting politics away from best representing the status quo to one that builds up ideas, and aspirations that can mobilise the best creative energies of the people should be the purpose of the electoral system. This is the direction that we must move in institution building. The republic we choose to build is not just one without a monarchy and an aristocracy, or even a bourgeoisie but one that gives a positive purpose to its people and institutions. 1. p21, Steve Freeman, “Scottish Referendum. The Crown Versus the People. England’s Case for Voting ‘Yes.’” RMB Publications nd. “To see why focus on the post-1931 vote – its downward shifting trend is clear as shown in Figure 2 which shows the descending part of the chart above. This thesis of ‘Tory decline,’ when I first produced the chart of this trend in 1983 at the height of Thatcher’s grip on politics, in my book “Thatcher and Friends,” was met with disbelief. But it met the test of seven out of the eight next general elections. It is certainly annoying for the author, and much more importantly tragic for the country, that in 2015 it didn’t. But as the chart [not cited] shows the Tory 36.9% in 2015 doesn’t break the overall descending trendline. “The underlying social forces that had produced the overall decline continued to operate even in 2015. Tory support in Scotland fell further to 14.7% – in 1945-55 Conservatives had more support in Scotland than England. In the North of England there was a swing to Labour. In the South’s urban bastion, London, Labour won 45 seats to the Tories 27. In contrast, in the South outside London, the Tories won seats from Labour.